"The course is great and without the college I wouldn’t have had the chance to get a job with Morrison Design Agency." 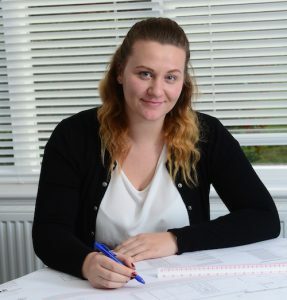 A teenager who transferred Derby College courses and became an apprentice is taking the first steps towards her dream job as an architect. Seventeen-year-old Suzanne Butler always had a love of design and was on a full time construction course when she got the chance, through the college, to apply for an apprentice role. Now she has transferred to study for a Professional Construction and the Built Environment Extended Diploma, while working as an Architectural Technician Trainee with Derby’s Morrison Design Agency. Once she completes the diploma, Suzanne expects to set out to gain RIBA qualifications and become a fully-trained architect.